Creating completely random passwords is actually a difficult task for the human if you really think about it; you could always called "asdfghjkl" random, but in reality, it might easily be duplicated by hackers because it isn't random and is obviously a row of characters on many keyboard layouts. With IOBit Random Password Generator, you have access to computer-generated passwords which contain numbers, letters and symbols. You are given the choice of password length from between 6 and 64 characters. One click on the "Create Password" button and your new random password is created. 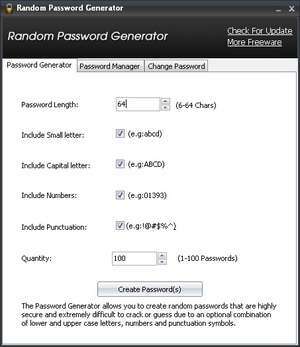 For security reasons, you should also check out the Random Password Generator download at LO4D.com which includes virus and malware tests. Additional screenshots of this application download may be available, too.